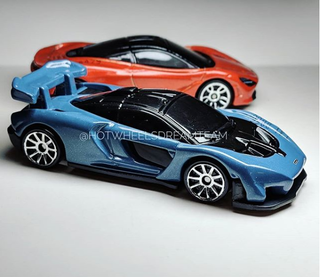 Let’s begin with the headliner act: the Hot Wheels McLaren Senna is almost complete. And look at the body of it. Ryu Asada nailed the design. With the Bugatti Chiron sure to come, this is a great time to be a hypercar fan. Here’s our best look at the Gumball C3 Corvette Super, plus Letty’s S14 in the Fast and Furious Premium line. We might want to de-tampo the Huayra, but I reckon it looks good either way. You’re also looking at the second completed car from the id line, which is also a Huayra. Man I wish they had the Roadster splitter on. Finally, pre-production versions of the Ford Ranger Raptor and the Jaguar I-PACE e-Trophy. The latter baffles me to no end. Why? Why, Jag? Why push this instead of the C-X75? Are you that ashamed of the car? Come on. There are some truly neat offerings coming soon, but also some doubt. There are only a few more slots remaining in other lines. Which new cars are still coming? Are we gonna get the ones we want, at least? Either way, prepare your wallets.